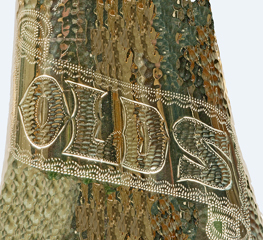 The Arnold Ruskin Collection, consisting of 153 outstanding trumpets, cornets, and flugelhorns assembled to document the models produced by F. E. Olds of Los Angeles and Fullerton, California, was donated to the NMM in the fall of 2008 by the collector's widow, Nancy, of La Cañada, California. An inventory of the collection can be found below. Arnold ("Arnie") M. Ruskin (1937-2006), who earned his Ph.D. in engineering from the University of Michigan, was a registered professional engineer and Professor of Engineering at Harvey Mudd College, Claremont, California (1963-1973), prior to co-founding the influential Claremont Consulting Group. The author of two books concerning project management, Ruskin also published more than 35 papers in the fields of engineering and management. As an amateur trumpet player and collector, Ruskin systematically assembled a collection of 122 cornets, trumpets, and flugelhorns representing virtually every model made by F. E. Olds in Los Angeles and Fullerton. 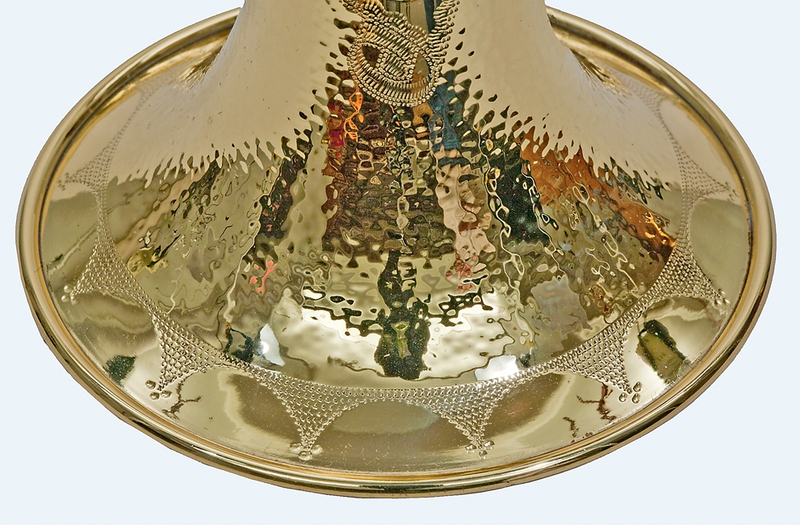 According to Olds researcher and noted brass instrument restorer/maker, Robb Stewart (Arcadia, California), Ruskins' collection "was probably the most complete collection of Olds brasses in private hands." NMM 14243. Cornet by F. E. Olds & Son, Los Angeles, 1932. Hand-hammered bell. With the addition of the Ruskin collection, the NMM's holdings of Olds instruments, which previously included twenty-two trombones, fourteen cornets and trumpets, a horn, and a sousaphone, was increased to 160 representative examples. An additional thirty-one trumpets and cornets by other makers are also represented in the Ruskin Collection, including instruments by Bach, Benge, Besson, Buescher, Courtois, Distin, Getzen, Higham, Jay, Marbeau, Pepper, Reynolds, Rexcraft, Wagner, and H. N. White. A collection of 145 mouthpieces, books about brass instruments, trumpet and cornet instruction manuals, music, instrument manufacturers' trade material, periodicals, and brass instrument accessories were also included in this substantive donation. As the Ruskin collection continues to be cataloged and photographed, NMM staff members are simultaneously contributing valuable research data to "The Olds Register" website, an online research database that is "attempting to document and publish to the greatest extent possible, the production log and current whereabouts of the trumpets and cornets produced by F. E. Olds & Son until the original company's demise in 1979." The Ruskin Collection is available to researchers and scholars by appointment in the NMM's Sally Fantle Archival Research Center. NMM 14301. Cornet in B-flat by Vincent Bach, Elkhart, Indiana, 1985. Stradivarius model. NMM 14193. Trumpet in B-flat by E. Benge, Burbank, California, 1967. NMM 14260. Trumpet in B-flat by E. Benge, Los Angeles, 1978. NMM 14190. Pocket trumpet in B-flat, after 1980. NMM 14276. Cornet in B-flat/A by Besson, London, ca. 1904-1908. Prototype model. NMM 14189. Cornet in E-flat (HP) by Besson and Co., ca. 1931-1938. Class A model. NMM 14228. Trumpet in C/B-flat/A by Buescher, Elkhart, 1927. True Tone line. NMM 14272. Cornet in B-flat by Antoine Courtois, Paris, after 1904. NMM 14278. Cornet in E-flat (HP) by Distin, London, ca. 1855. NMM 14223. Trumpet in B-flat by Getzen, Elkhorn, Wisconsin, before 1963. Super Deluxe model. NMM 14197. Bass trumpet, ca. 1964. 300 Series. NMM 14271. Trumpet in B-flat, ca. 1964-1967. Eterna, Severinsen model. NMM 14230. Trumpet in B-flat, ca. 1969. Eterna, Severinsen model. NMM 14270. Cornet in E-flat by J. Higham Limited, Manchester, England, ca. 1910-1915. Class A short model. NMM 14305. Cornet in B-flat by Harry B. Jay, Chicago, ca. 1912. Columbia model. NMM 14317. Alto horn by Jean Marbeau, France, ca. 1900. NMM 14310. Slide trumpet in B-flat attributed to F. E. Olds & Son, Los Angeles, ca. 1908-1950. NMM 14199. Trumpet in B-flat, ca. 1929. NMM 14218. Trumpet in B-flat, 1929. The Olds, large model. NMM 14241. Trumpet in B-flat, 1929. The Olds, medium bore model. NMM 14242. Trumpet in B-flat, 1929. The Olds, medium bore model. NMM 14244. Trumpet in B-flat, 1929. The Olds Symphony model. NMM 14250. Trumpet in B-flat, 1929. The Olds, large model. NMM 14287. Trumpet in B-flat, 1929. The Olds, Symphony model. NMM 14291. Trumpet in B-flat, 1929. The Olds, large model. NMM 14325. Trumpet in B-flat, 1929. The Olds. NMM 14206. Trumpet in B-flat, 1930. The Olds model. NMM 14238. Trumpet in B-flat, 1930. The Olds model. NMM 14257. Cornet in B-flat, 1930. The Olds model. NMM 14258. Cornet in B-flat, 1930. Military model. NMM 14269. Cornet in B-flat, ca. 1930. The Olds model. NMM 14303. Trumpet in B-flat, 1930. Military model. NMM 14293. Cornet in B-flat, 1930-1931. Military model. NMM 14235. Trumpet in B-flat, 1931. French model. NMM 14290. Trumpet in B-flat, 1931. French model. NMM 14313. Trumpet in B-flat, 1931. Super model. NMM 14243. Cornet in B-flat, 1932. The Olds model. NMM 14294. Cornet in B-flat, 1932. Radio model. NMM 14220. Cornet in B-flat, 1932-1933. Special model. NMM 14264. Trumpet in B-flat, 1932-1933. Super model. NMM 14330. Cornet in B-flat, 1932-1933. Special model (Radio model configuration). NMM 14273. Trumpet in B-flat, 1934. Super Recording model. NMM 14256. Cornet in B-flat, 1935. Special model. NMM 14311. Cornet in B-flat, 1935-1936. Standard model. NMM 14219. Cornet in B-flat, 1936. Special model. NMM 14233. Trumpet in B-flat, 1936. Standard model. NMM 14307. Trumpet in B-flat, 1937. Special model. NMM 14288. Trumpet in B-flat, 1939. Standard model. NMM 14304. Cornet in B-flat, 1939. Special model (Radio model configuration). NMM 14319. Cornet in B-flat, 1940-1941. Super Recording model. NMM 14214. Trumpet in B-flat, 1946. Super Sonic model. NMM 14231. Trumpet in B-flat, 1946-1947. Standard model. NMM 14237. Trumpet in B-flat, 1947. Super model. NMM 14262. Trumpet in B-flat, 1947-1948. Super Recording model. NMM 14240. Trumpet in B-flat, 1948. Standard model. NMM 14265. Cornet in B-flat, ca. 1950. Custom Diplomat model. NMM 14267. Cornet in B-flat, ca. 1950. Super Recording model. NMM 14277. Trumpet in B-flat, 1950. Ambassador model. NMM 14275. Cornet in B-flat, 1951. Studio model. NMM 14283. Cornet in B-flat, 1951. Super model. NMM 14296. Trumpet in B-flat, 1951. Super model. NMM 14205. Cornet in B-flat, ca. 1952. Studio model. NMM 14261. Trumpet in B-flat, 1952. Recording model. NMM 14194. Trumpet in B-flat, July 1952-February 1953. Méndez model. NMM 14253. Trumpet in B-flat, October 1953-August 1955. Studio model. NMM 14280. Alto trumpet in F, October 1953-August 1955. NMM 14309. Cornet in B-flat, October 1953-August 1955. Ambassador model. NMM 14328. Cornet in B-flat, August 1955-November 1956. Ambassador model. NMM 14302. Cornet in B-flat, Fullerton, California, ca. 1955-1979. Super Star model. NMM 14208. Cornet in B-flat, August 1955-November 1956. Méndez model M-5. NMM 14207. Trumpet in B-flat, November 1956-July 1958. Olds Special model. NMM 14314. Trumpet in B-flat, November 1956-July 1958. Opera model. NMM 14316. Cornet in B-flat, November 1956-July 1958. Recording model. NMM 14323. Trumpet in B-flat, November 1956-July 1958. Recording model. NMM 14332. Trumpet in B-flat, November 1956-July 1958. Ambassador model. NMM 14299. Cornet in B-flat, June 1958-September 1959. Méndez model, M-5. NMM 14200. Cornet in B-flat, July 1958-September 1959. Special long model. NMM 14327. Flugelhorn in B-flat, July 1959-September 1959. NMM 14225. Trumpet in B-flat, September 1959-June 1960. Super model. NMM 14295. Cornet in B-flat, September 1959-June 1960. Opera model. NMM 14308. Cornet in B-flat, September 1959-June 1960. Super model. NMM 14329. Trumpet in B-flat, September 1959-June 1960. Opera model. NMM 14333. Trumpet in B-flat, September 1959-June 1960. Special model. NMM 14216. Herald trumpet, March 1962-February 1964. Studio model. NMM 14285. Trumpet in B-flat, March 1962-February 1964. Custom kit model (with three detachable bells and four leadpipes). NMM 14289. Trumpet in B-flat, March 1962-February 1964. Special model. NMM 14326. Trumpet in B-flat, March 1962-February 1964. Recording model. NMM 14229. Trumpet in D, February 1964-February 1965. D-10 model. NMM 14318. Flugelhorn in B-flat, February 1964-February 1965. NMM 14202. Trumpet in B-flat, February 1965-June 1966. Recording model. NMM 14279. Trumpet in B-flat, February 1965-June 1966. Studio model. NMM 14315. Trumpet in B-flat, February 1965-June 1966. Opera model. NMM 14210. Cornet in B-flat, June 1966-June 1967. Studio model. NMM 14215. Cornet in B-flat, June 1966-June 1967. Recording model. NMM 14224. Herald trumpet in B-flat, June 1966-June 1967. Studio model. NMM 14236. Trumpet in B-flat, June 1966-June 1967. Recording model. NMM 14306. Trumpet in C, June 1966-June 1967. NMM 14322. Cornet in B-flat/A, June 1966-June 1967. Recording model. NMM 14324. Flugelhorn in B-flat, June 1966-June 1967. NMM 14254. Cornet in B-flat, June 1967-June 1968. Opera model. NMM 14263. Cornet in B-flat, June 1967-June 1968. Opera model. NMM 14281. Cornet in B-flat, June 1967-June 1968. Ambassador model. NMM 14191. Alto trumpet in F, June 1968-June 1969. NMM 14259. Cornet in B-flat, June 1968-June 1969. Studio model. NMM 14286. Trumpet in B-flat, June 1968-June 1969. Ambassador model. NMM 14185. Cornet in B-flat, June 1969-June 1971. Studio model. NMM 14209. Trumpet in E-flat, June 1969-June 1971. The Olds model. NMM 14217. Trumpet in B-flat, June 1969-June 1971. Custom Crafted model. NMM 14334. Cornet in B-flat, 1971. Silver Sonic model. NMM 14213. Trumpet in B-flat, June 1971-June 1972. Super model. NMM 14312. Trumpet in B-flat, June 1971-June 1972. Studio model. NMM 14211. Trumpet in B-flat, June 1972-October 1973. Super Ultra Sonic model. NMM 14247. Trumpet in B-flat, June 1972-October 1973. Pinto model. NMM 14292. Trumpet in B-flat, June 1972-October 1973. Special model. NMM 14297. Trumpet in B-flat, June 1972-October 1973. Custom Crafted model. NMM 14300. Cornet in B-flat, June 1972-October 1973. Special model. NMM 14320. Trumpet in B-flat, June 1972-October 1973. Custom Crafted model. NMM 14331. Trumpet in B-flat, June 1972-October 1973. Custom Crafted Ultra Sonic model. NMM 14298. Trumpet in B-flat, June 1973-November 1974. Super Star Ultra Sonic model. NMM 14192. Trumpet in C, October 1973-November 1974. The Olds model. NMM 14222. Trumpet in B-flat, October 1973-November 1974. Méndez Ultra Sonic model. NMM 14274. Cornet in B-flat, October 1973-November 1974. Super Star model. NMM 14183. Flugelhorn in B-flat, November 1974-April 1976. Super Star model. NMM 14184. Flugelhorn in B-flat, November 1974-April 1976. Super Star model. NMM 14226. Trumpet in B-flat, November 1974-April 1976. Pinto model. NMM 14232. Trumpet in B-flat, November 1974-April 1976. Super Ultra Sonic model. NMM 14234. Trumpet in B-flat, November 1974-April 1976. Ambassador model. NMM 14284. Trumpet in D, November 1974-April 1978. Custom Crafted model. NMM 14186. Trumpet in B-flat, April-September 1976. Custom Crafted, Ultra Sonic model. NMM 14239. Flugelhorn, September 1976-March 1977. L-12 model. NMM 14195. Flugelhorn, March-September 1977. Clark Terry model L-13T. NMM 14203. Trumpet in Eb, March-September 1977. Ambassador model. NMM 14251. Flugelhorn in B-flat, March-September 1977. Super Star model. NMM 14255. Cornet in B-flat, March-September 1977. Ambassador model. NMM 14187. Trumpet in B-flat, October 1977-July 1979. Clark Terry, Ultra Sonic model. NMM 14188. Trumpet in B-flat, October 1977-July 1979. Clark Terry, Ultra Sonic model. NMM 14282. Cornet in B-flat, October 1977-July 1979. Ambassador model. NMM 14246. Alto horn in E-flat by J. W. Pepper, Philadelphia, ca. 1900. Surprise model. NMM 14212. Bugle by Rexcraft U.S.A., ca. 1919-1933. Official Boy Scout Bugle. NMM 14198. Trumpet in B-flat by F. A. Reynolds, Cleveland, ca. 1936-1940. NMM 14201. Alto trumpet by Gustav Wagner, Dresden, ca. 1930-1934. NMM 14248. Trumpet in B-flat by H. N. White, Cleveland, ca. 1929. King Liberty model number 1. NMM 14245. Trumpet in B-flat, ca. 1932-1934. King Liberty model number 1. NMM 14266. Cornet in B-flat, ca. 1932-1935. Master model number 1. NMM 14227. Trumpet in B-flat, ca. 1941. Silvertone Liberty model. NMM 14221. Trumpet in B-flat, ca. 1945-1946. Silvertone Liberty model. NMM 14204. Cornet in B-flat, ca. 1948. King Master model No. 2. NMM 14268. Cornet in B-flat, ca. 1950. Silver-sonic Master Model number 2. NMM 14196. Trumpet in B-flat, ca. 1962. Super-20 Silver Sonic Symphony model. NMM 14249. Trumpet in B-flat, ca. 1963-1964. Super-20 Symphony, Silver Sonic model. NMM 14252. Trumpet in B-flat, ca. 1969. Super-20 Symphony, Silver Sonic model. NMM 14321. Trumpet in B-flat by H. N. White, Eastlake, Ohio, ca. 1993. Silver Sonic Anniversary model.